November | 2013 | Love Those "Hands at Home"
I have much to be thankful for. But I’m not going to write about it because you already know; I’m thankful for the same things you are—family, friends, bounty, health, happy memories. I just want to say how thankful I am that, in the United States, today is set aside specifically for giving thanks. I try to recognize, every day, how lucky I am but I can still fall into the morass of worry and envy, seeing only how things could be better. But Thanksgiving Day encourages me to be mindful of every single thing, small and large, that makes my life happy, easy, full. Thanksgiving isn’t commercialized and all tarted up like Christmas; it isn’t tied to a religion or subset of Americans; there’s no incessant, annoying soundtrack for Thanksgiving. It’s just a nice, quiet day where we all think about, and maybe even say out loud, how lucky we feel. We should have more days like this! Enjoy today and count your blessings, wherever you live! But I spent my morning with a grandmother who has been dead since I was 12, two cousins who live hundreds of miles away, and a sister sound asleep in the guest room. No, I didn’t have a séance and I wasn’t Skyping. I spent the last three hours wrapping a gazillion (really—I counted) little squares of caramel in a gazillion little squares of waxed paper. As I stood at the counter and wrapped, I daydreamed and I am, if I say it myself, a world-class daydreamer. 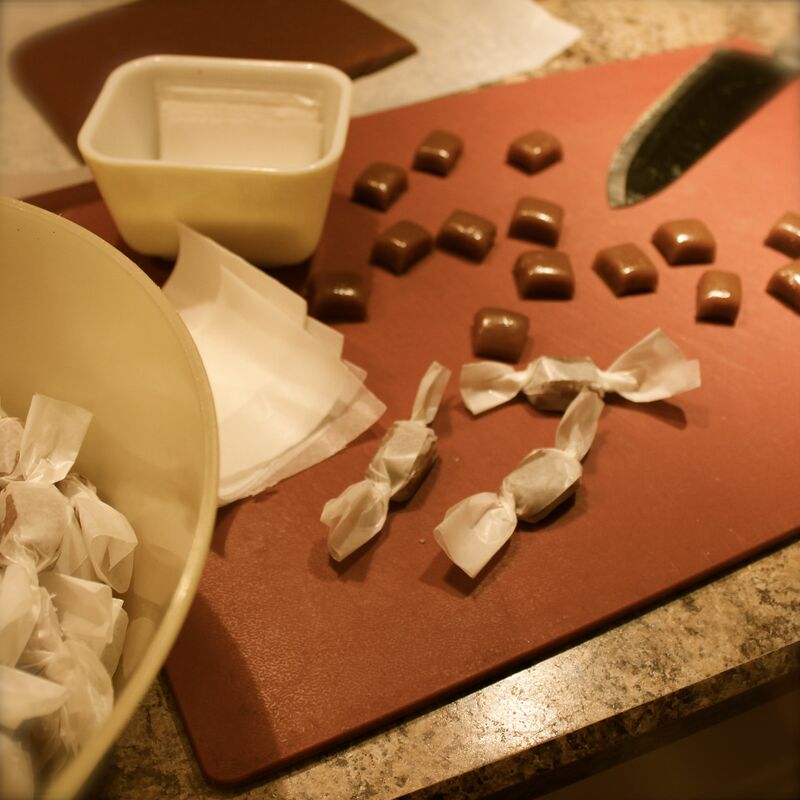 I daydreamed about my history with wrapping caramels. Caramels have been a part of the winter holidays for me for, literally, my whole life. I grew up on a farm and my grandmother made caramels (and divinity) only at this time of year, for Thanksgiving and Christmas, so it was a big event. I’m still using her recipe—it takes a full two hours or more to make a batch and involves instructions like, “add the milk, drop by drop. Add the butter, bit by bit.” We kids—my sister and two cousins and I—weren’t encouraged to be around while the caramel was cooking because the hot syrup can cause the most awful burns but, once the caramel was poured and had time to set, our work began. We were the caramel wrappers! We didn’t see this as work at all. Or, if it was work, it came with great benefits! I’m sure we didn’t eat as many as we wrapped but I’m also sure we needed some time outside after we were done, to work off the sugar high. 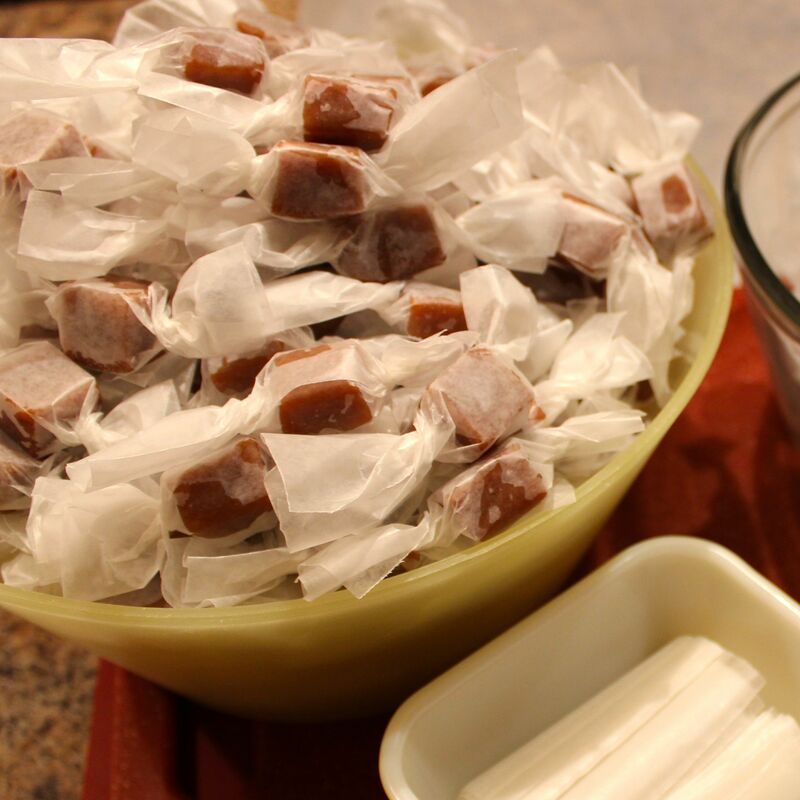 My grandmother would carpet the kitchen table with little squares of waxed paper, cut the caramel into strips, and cut little pieces—plop, plop, plop—onto the paper. Little hands would pick up each square, wrap the waxed paper around and twist the ends to seal the caramels in. Nowadays, a lot of my caramel gets dipped in chocolate or added to some other candy, like turtle bark or candy bars. The chocolate-covered fleur de sel caramels are by far my best-selling item. But sometimes, I do get orders for the pure, unadulterated caramels and, as was the case this morning, I find myself wrapping little bites of caramel in squares of waxed paper. And my mind wanders to a different warm kitchen, four little girl cousins, a plump farm grandmother, sweets made with loving hands at home—a scene out of Norman Rockwell and perfect for daydreams and happy memories. Wrapping caramels still comes with benefits. I hope you have the chance to daydream and enjoy family memories on your day of thanksgiving! In late autumn, the leaves are off the trees, after that amazing show they put on before they blew away. The flowers are gone, the grass and fields are brown, everything is a little drab and monotone and low key. The lights have been turned down on the show. And the snow geese, clever birds that they are, know that at this time of year, nothing can upstage them! They have the spotlight, they are the stars of the local stage. 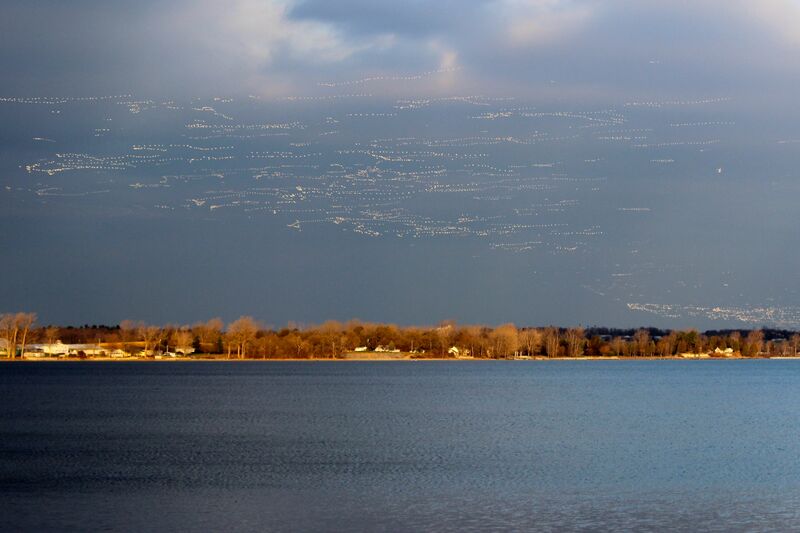 I posted last week about a magical moment when I saw snow geese taking off against a dark sky. Since then, I’ve pretty much stalked them like a paparazza. They are always fascinating but still photos don’t necessarily capture their glory fully. The constant, seemingly chaotic, movement that suddenly resolves itself into a perfect V in the sky and the raucous, noisy chatter are a critical part of the overall experience. But I can offer you photos. 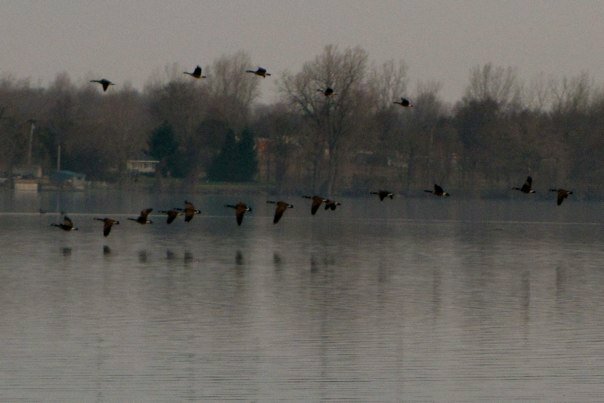 Many of these are taken at a distance, to show the spectacular numbers of geese gathered in one spot. I hope you’ll click on the photos to get a better look! 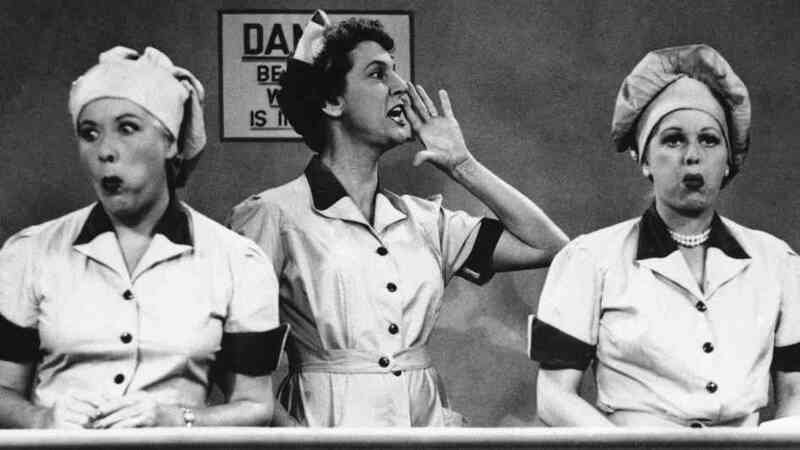 Do you know this episode of the old American TV show “I Love Lucy”? Lucy and her pal, Ethel, get jobs in a candy shop and are soon overwhelmed by the workload. It’s a classic! As you may recall, I make candy. I can totally identify with Lucy and Ethel right now! I am pretty fully occupied by the demands of the holiday candy season. I love what I’m doing–I’m up to my knees in chocolate! A dream come true! But it may mean that my blog is updated less frequently and my posts are short. Please understand that I am thinking of you and will be back with more thoughtful posts as soon as I can be! That Magic Moment, When I Looked into the Skies . 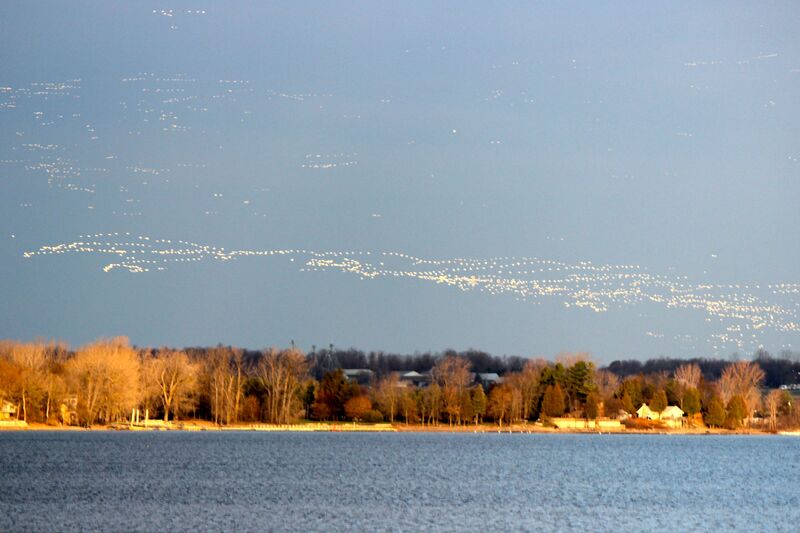 . .
And saw thousands of snow geese taking off from the lake and swarming south. I was tempering chocolate for an order, and glanced out my kitchen window. 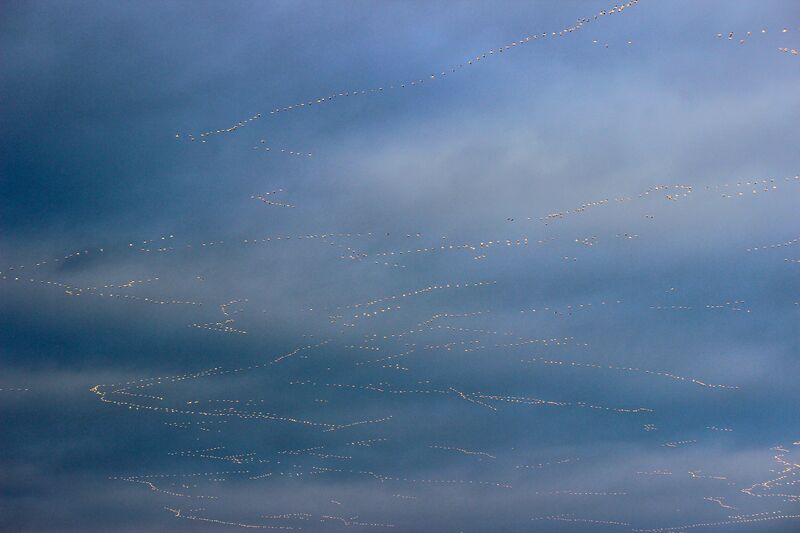 The sky was black and blue, and the geese sparkled against it. I wish I could provide you with sound effects, too! Ten minutes later, the sky was overcast and gray and the geese were out of the picture. Isn’t serendipity a wonderful thing? Looking for a new recipe for a tailgate or fall party? Need to feed a lot of people at a Super Bowl gathering? Want a recipe that most people will never have heard of before and will have them clamoring for more? You need to make Michigan Red Hots! Michigans have something for everyone. Well, except vegetarians. And the gluten intolerant. And dieters. Almost everyone. They have a history, dating back to the 1920s. They are the subject of long-standing debates and rifts among family members. They are homey and regional yet are on the verge of being discovered. You can be on the leading edge of the Michigan revolution. Okay, okay—so what is a Michigan? It’s a hot dog in a bun with meat sauce on top. Don’t you think that sounds special? Well, it is. 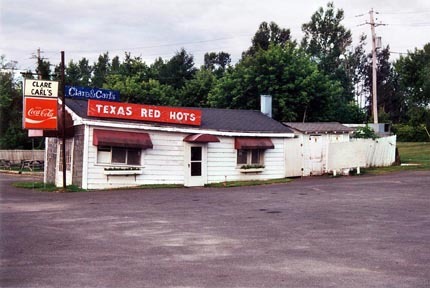 Michigan Red Hots have been a favorite in the North Country of upstate New York almost 90 years. This area is the northeast corner of New York State, closer to Montreal, Quebec, and Burlington, Vermont, than New York City. It’s not quite the same as a chili dog or a Coney or a Texas Red Hot. In this part of the world, people have been going to roadside stands since the 1920s, looking for Michigans. No one really knows where the recipe came from or why the delicacy is called a Michigan. There are many tales about Coney Island hot dogs meeting sauce made by a woman from Nashville. 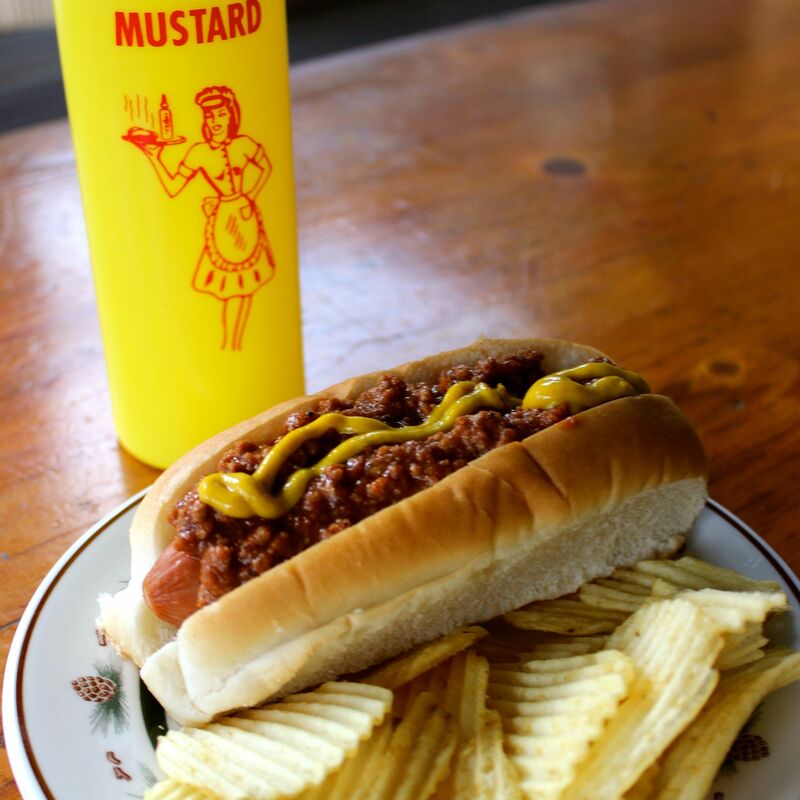 The Nashville woman married someone from Detroit and then they moved to Plattsburgh, New York, and starting selling the hot dogs and called them Michigans. I say, who cares? It’s not important where the name came from. What’s important is trying Michigans at as many stands and diners as possible, to find the uber-Michigan. Everyone, everyone, has an opinion about the best Michigan. Once there was a stand called Nitzi’s that was definitely in the running but Nitzi retired and sold the business but, the lore says, he didn’t pass his sauce recipe along to the new owners. Is Nitzi’s sauce lost? Or is it being used at another small shop? Was it best? Many will say Clare and Carl’s is best. You could buy them here, as long as the building continues to stand! Others swear by Gus’s Red Hot’s as the quintessential Michigan. McSweeney’s is a relative newcomer, Ronnie’s has been around forever but is very different than all the others, and so on, and so on. The differences among these are subtle but don’t try telling that to the fans of any of them. Husbands and wives can’t agree. Parents and children are split. Compromises abound—“I’ll go to Clare and Carl’s today but next time we go to Gus’s! If you order a Michigan in a restaurant and want to sound like a local, you say “Two Michigans with” if you want onions. My husband says, “Two Michigans with, buried” and I say, “One Michigan, without.” They are usually served with French fries and coleslaw, which is all really nice but the focus here is on the Michigan. Rachael Ray did what I consider to be an evil thing—presented a recipe for basic Michigan sauce but then felt the need to add macaroni and cheese to it and put the whole con-glop-eration on top of a hot dog. The woman has no sense of a) tradition or b) moderation! If you can’t make it to upstate New York but yearn for this special treat, the recipe that follows is one I’ve had for about 30 years. It is purported to be Clare and Carl’s recipe but tastes, to me, more like the Michigans from Gus’s. Whatever. 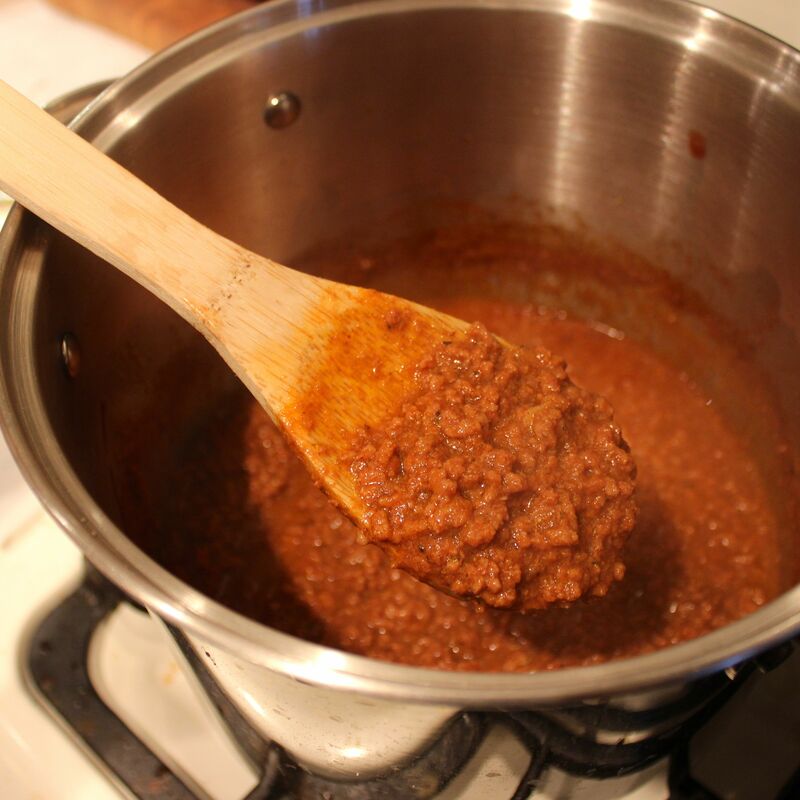 This recipe makes a sauce that is very close to the typical Michigan you’d get at most places in the North Country. Mix all ingredients together, except meat. Add meat raw and cook while stirring occasionally with a fork. The fork is important to get the consistency right! Michigan sauce doesn’t have chunks! Simmer 2-3 hours. 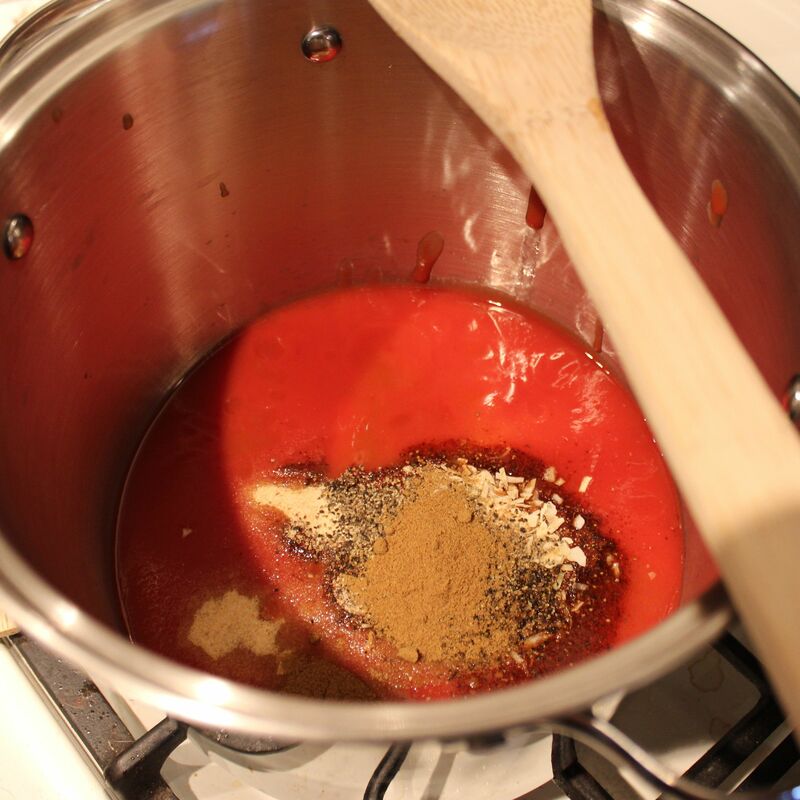 You can do this all in a slow cooker but, if you leave the top on, the sauce will be very soupy. You want the sauce to be pretty thick when it’s done. The recipe makes quite a lot of sauce. I freeze some of it in ice cube trays and, when the cubes are frozen, I pop them out and put them in the freezer in a freezer bag. Then, when I want a Michigan, I just grab two cubes and put them in the microwave for a little while! 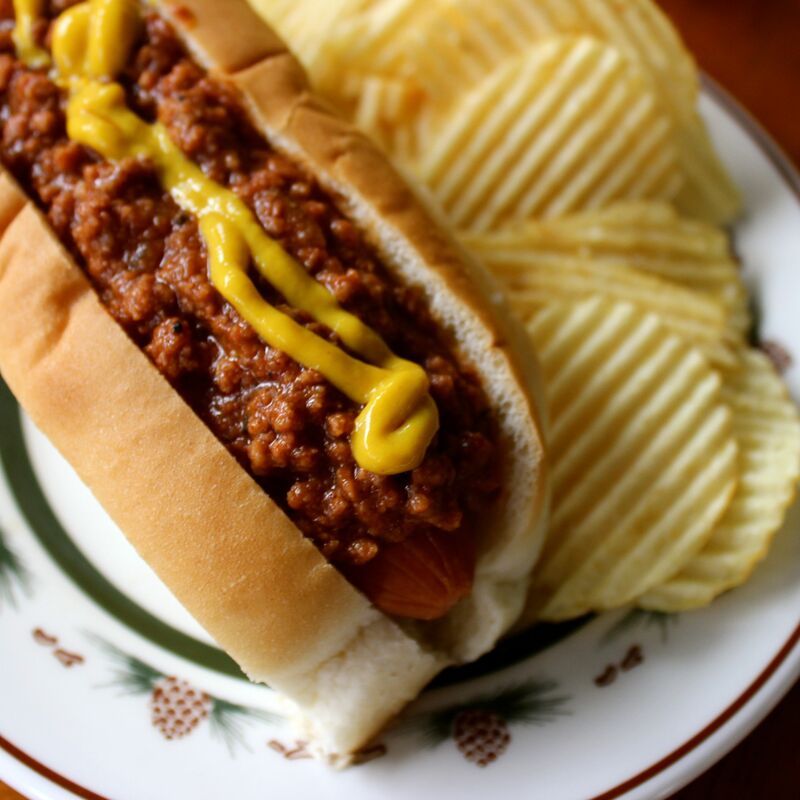 If you’re not a fan of hot dogs, you can put Michigan sauce on a hamburger roll, for a Sloppy Joe kind of sandwich; up here that’s called a sauce burger! * You can get fancy and use real onion and garlic—maybe it’ll taste good but it won’t be a Michigan any more! When I was a child, my grandmother always talked about how glad she was that there was a window over her kitchen sink. She lived in a big old farmhouse and the window looked over the back yard, with the sugarhouse and the chicken coop. I never understood what the big deal was. Nothing happened in the sugarhouse, except during early spring when the sap was being boiled down, and who wants to look at chickens? Now that I spend a lot of time in the kitchen, tending caramel while it burbles on the stove or stirring chocolate for long periods, to temper it, I finally understand what my grandmother saw there. Looking out a window, and letting your mind wander, near and far, helps pass the time spent doing the most prosaic chores. My grandmother didn’t just see chickens scratching and empty farm buildings. She saw her grandchildren playing and, maybe in her mind’s eye, she remembered her own children out there. She lost a daughter, at age 12, so maybe she remembered Ruth swinging on the gate, and the boys on the ponies. 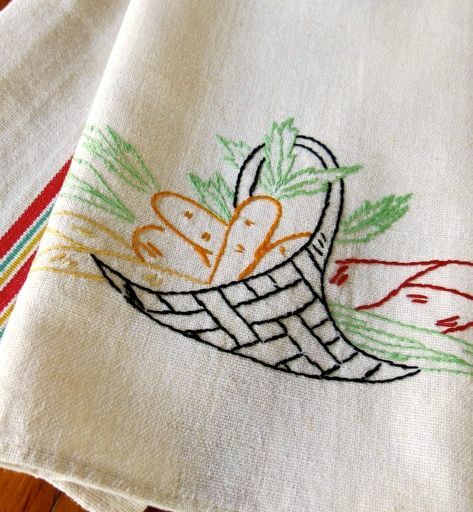 Maybe she remembered her own youth, on a farm not far away, and in her memories moved from the farm kitchen, doing dishes and baking bread, back to tree climbing and rambling through the orchards. This is the view I’m fortunate to have outside my kitchen window, to occupy my eyes and mind while I make candy. Since candy-making season, for me, extends from fall to spring, I can watch the seasons change outside this window. In the fall, I watch the leaves turn on the trees across the bay and see, and hear, the Canada geese and snow geese as they spend a few raucous weeks getting ready to head south. Then I think about the time when I’ll fly south and visit my mom and friends, and escape the North Country winter for a little while. It’ll still be here when I get back! Before too long, I’ll be watching ice fishermen instead of geese and reminding myself that, if one goes through the ice, I should call 911 and absolutely should not run out on the ice to try and help! I’ll wonder what makes those fishermen tick—what do they think about while they sit out there waiting for a bite? Why are they there? Do they need the money so badly that it’s worth catching fish in the cold?? Or are they out there daydreaming, while I’m in my warm kitchen daydreaming? And, in a few months, I’ll catch my first glimpse of a robin outside this window. I’ll see those geese on their return flight and think about the cycles of seasons, days past and future, what tomorrow and this season will bring. I’ll look forward to summer, when family and friends gather here at the lake, and I’ll study the landscape for the first signs of growth, re-birth, in my gardens. It’s not just a window to outdoors, although the outdoors is well worth viewing in its own right. My window is a trigger for my memory and my imagination, just as it was for my grandmother and no doubt her grandmother before her. When I was a girl, I looked out the window. It just took me a while to see.